It's with you for the long-term, so choose a Wacktrap username you won’t forget. Don’t worry, we'll send you your name if you do. But if you’re forgettin’ it so soon, no one else is rememberin' it either. When your wack's promoted to the frontpage, that name of yours is goin' round the world. That claim to fame is yours, so make your name a fantastic-and memorable-one! Your Wacktrap username might be dazzling, silly, righteous, energetic, charming, alluring, fantastic, unusual, upbeat, witty, entertaining, succinct-or virtually any other adjective that comes to mind. This is your identity we're talkin' about-so make it your own! If you value your privacy as much as we do: please avoid using your first and last name, or first initial and last name. John A. Doe? If privacy is of strict concern to you, keep in mind that ‘johndoe,’ ‘johnadoe,’ ‘jdoe,’ or ‘jadoe' probably won't maintain that strictest privacy you're lookin' for. That surname of yours is mighty important to sites that depend on it. Sites like Facebook need it, for specific purpose. 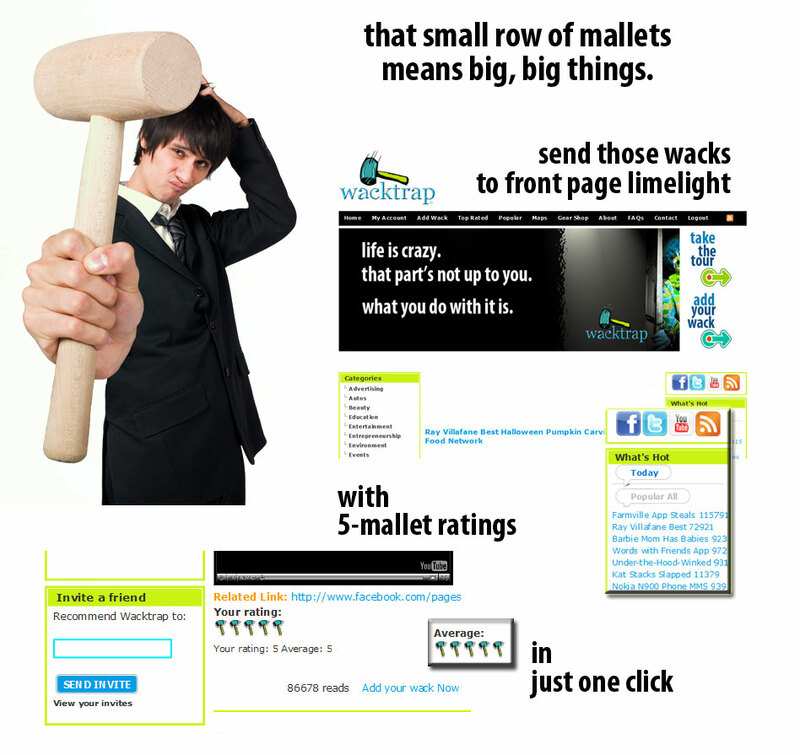 We'll help you send those best wacks to your Facebook profile and tweet those wacks using Twitter. At Wacktrap we’re helpin’ you connect-in a different and very powerful way. So while that offline name you’ve been using all these years will continue to be handy for regular stuff, you won’t be needing it here. You’ll be adding your new Wacktrap username to that arsenal of yours-and we think you’ll find it a mighty powerful tool indeed. If you're insistent that you'd like to use your name or portion of your name for simplification or another reason, the choice is yours. You are not required to use any part of your name within your Wacktrap username. Remember: punctuate life, not your username. Keep those dashes, underscores and any symbols out of your Wacktrap username-and out of the way. Using 'em only hinders our Search function, making it harder for friends and admirers to find you fast.